Recently the City came round and filled some potholes in my street. As I watched the craftsmen leveling the patches, I realized that they were doing what I do when I fill dents and chips in lacquer finishes. It's just a matter of scale - their finish is a thousand times thicker than mine. I was impressed with the quality of their job, too. It came out nice and level, and apart from color, it was just the same as the original finish. 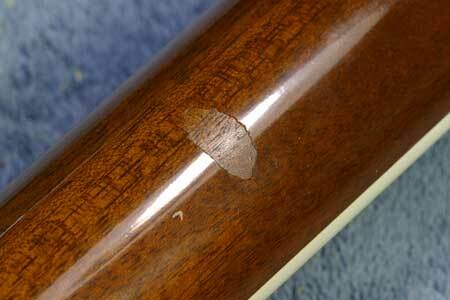 It's a patch of lacquer that was chipped off the back of a Martin guitar neck. 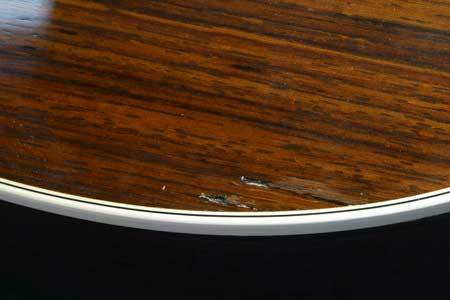 In my opinion the best thing about nitrocellulose lacquer is that it is an evaporative finish, meaning that it can always be redissolved in its original solvent. Other, more modern finishes are catalyzed polymers and as they cure, they undergo chemical changes that make them insoluble in anything. So, while I can fill and level such finishes, I don't have an easy time of making the filled area look seamless with the surrounding original finish. Over the next few days, I'll continue to add more thin layers of new lacquer, brushing it carefully to avoid bubbles or runs. My goal is to have the new filled area a bit higher than the original surface, so I can level it without damage to the adjacent areas. The street crew used a big heavy roller to mash the new fill and compact it until it was level with the old asphalt. 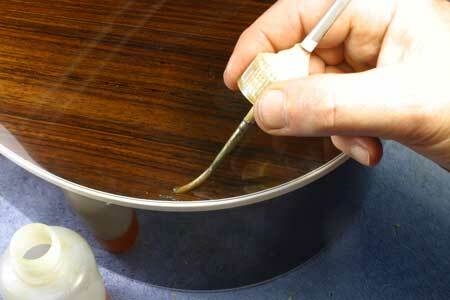 My lacquer has about 25% "solids," meaning that 75% of the thickness will go away as the solvents evaporate from it. Wherever the new lacquer's solvents touch the original lacquer, they will soften and cause that area to expand a bit in the process. 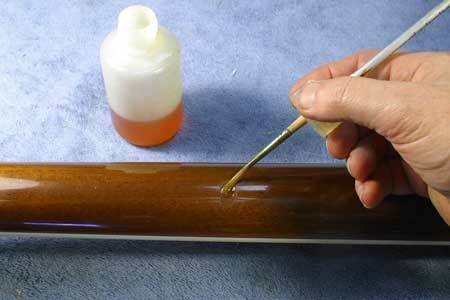 After the first day of drying, the lacquer will have lost a majority of its volatile solvent, and it may even feel hard enough to level and polish. BUT, if I were to level the finish and get it nice and shiny, the remaining solvents would continue to evaporate, and by the next day the filled area would have sunk to a really noticeable extent, forming a shallow crater. So, that's why I like to let the drop filled area dry a good long while before leveling it. In fact, my new filled area is considerably thicker than the original finish that was applied to the guitar, so my drying time must be extended accordingly. 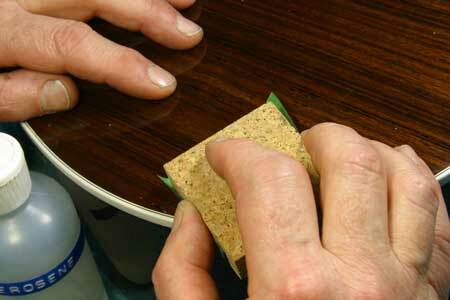 Many factories get by with around ten days for an entire nitrocellulose lacquer finish. "Boutique" makers are more likely to allow double that time. With my thicker finish fill, I like to have a solid three weeks at least for a really good cure, after the last coat is applied. If the dent is really deep, I'll fill first with a non shrinking catalyzed material, and use lacquer on top to match the original. Otherwise, the drying time could be nearly infinite! The idea is that the tape is a couple of thousandths of an inch thick, and with a little care I can scrape the new filled area down until the razor blade won't cut any more, leaving my new fill "proud" of the original by just that amount, only one or two thousandths. 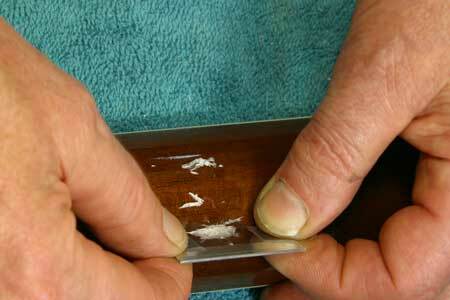 Click here for a bit more on razor blade scraping. 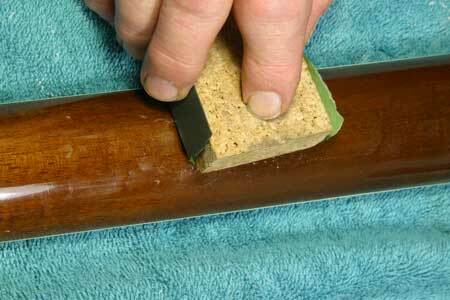 Kerosene works better than water to keep the sandpaper from loading up, and it won't cause the wood grain to swell or raise if it gets into any little cracks or voids in an old finish. 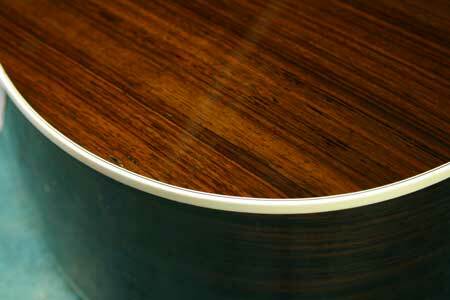 One of the most disappointing things that can happen to a new lacquer finish is that insidious "weather checking." I use a variant of the drop fill technique to work on them. Click here for the full story.